Finalising the installation of Europe’s cryogenic tanks on-site, ITER Cryoplant, April 2018. Temperatures are on the rise on the ITER construction site as the sunlight is showering its vast platform. The workforces on the ground are fixing their hard hats and roll up their sleeves as they are heading to the different buildings. The site is the home of the experiment that will recreate a small sun on Earth with a burning plasma of 150 million ° C. Usually, the project’s high temperatures capture our imagination when we talk about ITER. This time, however, the installation of Europe’s massive equipment on the premises of the Cryoplant, which can be described as a massive “fridge”, puts on the spotlight the low temperatures that will reach -269° C. Eleven cryogenic tanks, cold boxes, and the first compressors, have taken their final position to deliver plenty of cold power. Europe is one of main contributors to ITER’s impressive cryogenic system which is needed to cool down the powerful magnets to become superconducting in order to confine the superhot plasma. F4E is responsible for the procurement of half of the Cryoplant’s components. Its construction and the successful installation of Europe’s equipment on its premises make this a landmark achievement for F4E’s teams working in the teams of cryogenics and transport logistics. The first European cryogenic tank was delivered in November 2016 and almost a year later all tanks followed departing from different countries. In parallel, the cold boxes and the first compressors followed. Air Liquide and its subcontractors, have been responsible for their production and DAHER for their transport and logistics. Everything about ITER is epic — its partnership, scale, complexity and the forces of nature that will work together to win the fight against climate change. The people behind this milestone and the companies involved are an important part of the story. Didier Magnet, Large Projects Director of Air Liquide Advanced Technologies describes in detail the involvement of the different suppliers. "The main pieces of equipment of the cryogenic plant are now delivered on site, including the impressive helium and nitrogen storage tanks, cold boxes and compression stations. We faced many challenges that our teams took up alongside our customers. 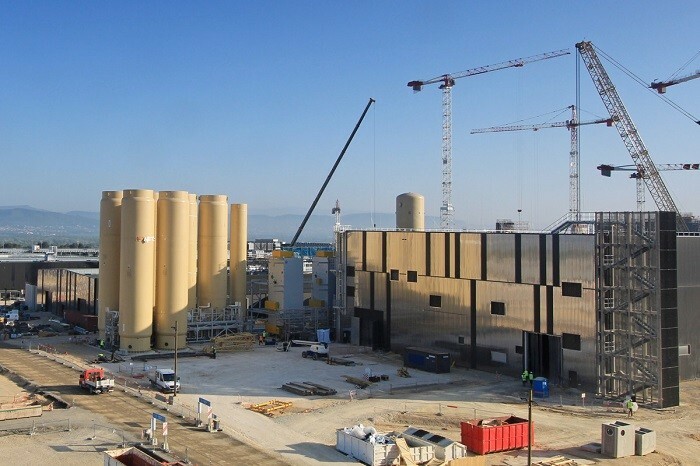 After having ensured the design of equipment and manufacturing, Air Liquide's teams are moving ahead with the installation of the cryogenic plant.This important milestone is the result of more than 100 members of staff from Air Liquide working in engineering activities, 80 main suppliers and up to 150 people on site." Lifting one of the two quench tanks financed by F4E and produced by Chart Ferox. ITER Cryoplant, April 2018. On ITER’s Helium (He) plant an army of cryogenic tanks have been installed: six warm Gaseous Helium (GHe) tanks manufactured by Zhangjiagang Furui Special Equipment Co. LTD (China); one Liquid Helium (LHe) storage tank manufactured by CryoAB (Sweden), able to store up to 70% of the helium that the plant will need; and two quench tanks produced by Chart Ferox (Czech Republic). Europe is also responsible for the Liquid Nitrogen (LN2) plant. One liquid nitrogen (LN2) tank, manufactured by Aritas (Turkey) has been installed on its premises, plus the gaseous nitrogen (GN2) buffer tank manufactured in China by Furui. In parallel, the race for the installation of auxiliary pieces of equipment has started with the compressors and cold boxes. 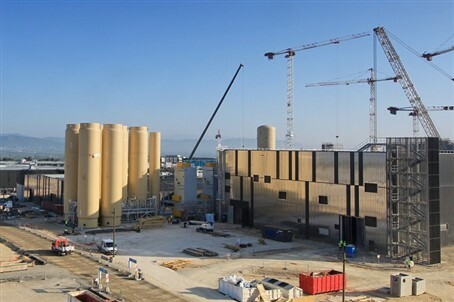 The installation of all cold boxes, manufactured by Nuclear Industry 23 (China) has been completed, together with the LN2 compressors produced by Atlas Copco Energas (Germany/Belgium). More components produced by Europe have been installed on-site: the two quench tanks on the ground, the LHe tank on the level above, and the cold boxes. At the far end the remaining cryogenic tanks.